When people ask us, as they frequently do, why two city dwellers should suddenly buy a 16 acre bare paddock in Dry River Road, Martinborough, dismiss the sheep and plant 10,000 vines by spade, the answer is palpable – we’d simply lost our marbles. What had been envisaged as a gentle descent into middle age retirement has turned into a thriving 24/7 bustle of vinetending, winemaking, marketing and restaurateuring – each operation undertaken in the hallowed, self-flagellating Martinborough tradition – by manual labour. Be it leaf-plucking or bunch thinning by hand in the vineyard to ensure umblemished, perfectly ripe fruit, or the sheer tastiness of Margaret’s cuisine which derives from the traditional “homemade” quality of every ingredient served to appreciative diners – the Coney aim is to pay keen attention to detail. And so the old-fashioned notion that small is beautiful, that honest sweat produces happiness turns out to be our guiding principle. In the modern world, a small vineyard/winery represents one of the few remaining occupations where a bloke can go from planting to bottle, get out of the house/office and enjoy the sun on his back to music. Our logo, the treble clef, with grape bunch delicately appended, comes from the family’s love of music – it is also a nice metaphor for the harmony experienced in a lovely wine. Headphones are mandatory in the vineyard, and many a passing local has marvelled at the gangly Coney legs in gyration to an Eagles, LRB or Beatles number. Scientific tests also confirm that grapes respond positively to a diet of 1970’s music!! The wines themselves have harmonious names – Rallentando, Ragtime, Ramblin’ Rose and Pizzicato. These three have now been joined by tiny quantities of Piccolo Pinot Gris and Que Sera Syrah. I am advised that Piccolo is made in the fuller, broader Alsace style. Pale straw colour. 13.5% alcohol. 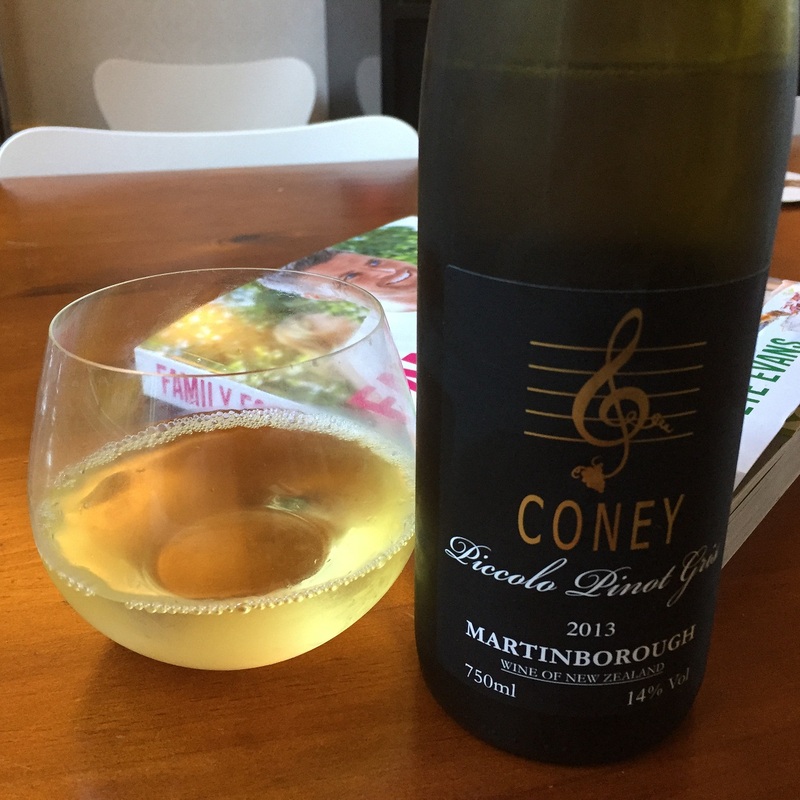 This entry was tagged 13.5%, 2013, 4, Coney Wines, Martinborough, Pinot Gris, Wine of New Zealand. Bookmark the permalink.